Too often Enescu is remembered only for those two Romanian Rhapsodies of which the composer, himself, in 1950, said - "
I am absolutely fed up with them, especially the first." As Noel Malcolm says, "Enescu could never shake off the incubus of these two simple pieces which dominated and narrowed his reputation as a composer." the greatest musician and the most formative influence I have ever experienced.' Casals claimed that Enescu was, in the depth and range of his gifts, the greatest musical phenomenon since Mozart. This is a vastly interesting book, I cannot remember making so many notes or annotations to a book on a composer's life and music for many years. If I quoted from half of the pages I turned the corners down, this review would stretch way beyond the editor's forbearance. The book details Enescu's life from his early years in Romania where he was entranced by the rich diversity of the Romanian folk music tradition, through to his sad death in poverty in Paris during the night of 3/4th May 1955, after his wealth had been lost in fleeing Communist Romania after World War II. We read of Enescu's fascination with polyphony and about his early compositions and of the Queen of Romania's patronage of his music. (The Queen was a colourful character and very artistic writing under the name of 'Carmen Sylva.') All the major musical figures of the age continue to parade through the pages of the book as it advances through the life of the composer all the while the author describing all the works in accessible terms loaded with just the right amount of musical examples. The chamber music, instrumental pieces and the orchestral works including the symphonies are all covered. There is a whole chapter devoted to Enescu's opera Oedipe (recorded by EMI in 1990) over which he laboured for many years. It was finally stage to critical approval but audience apathy (there are no love duets). Like wise there is a substantial amount of space devoted to his Vox Maris a maritime tone-poem for choir and orchestra and his late and highly evocative Impressions d'Enfance for violin and piano. Time and again we read of Enescu's prodigious talent as both violinist and conductor about his remarkable memory and how he could absorb whole scores and replay them with complete accuracy. We learn of his total dedication to the composers' wishes as a performer or conductor. We read of his generosity to the musicians he championed - Dinu Lipatti and Clara Haskil especially. And, of course, of his special relationship with Yehudi Menuhin - how they met and how he worked with rather than didactically taught the young violinist. We learn about his relationship with the beautiful Marie Cantacuzino who he married after the death of her husband as he had promised even though, by that time, she had become mentally unstable and a liability. We read of his reputation as a conductor admired by many including Elgar, Mengelberg and Paray. 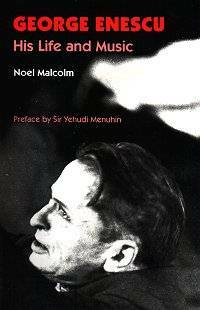 The book contains a list of works, a list of recordings by Enescu as violinist, conductor and pianist. There is also a bibliography and index of works plus a general index. Curiously there is not a separate discography of Enescu as composer only those recordings of his own works by made by himself are included. Considering the dedication of the Olympia record company to Enescu's works in recent years this is a startling omission. An outstanding book and a rattling good read.